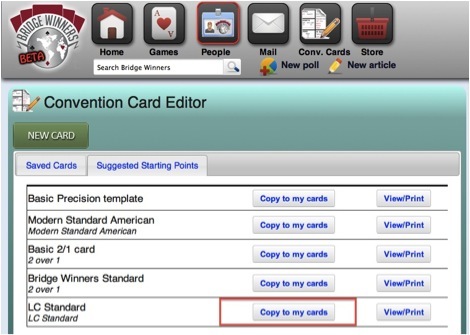 The BridgeWinners Convention Card Editor application allows you to create, copy, edit, print, share and collaborate on convention cards with your bridge partners over the web. You can collaborate on different convention cards with different partners, and keep as many as you like. All you need is a BridgeWinners account (free) to access the application. This guide will walk you through the steps required to create, print and manage your convention cards. 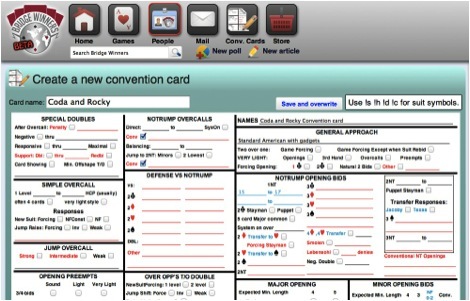 The convention card application can be accessed either by clicking on Explore/Convention Card Editor at the top of the page, or by clicking on the convention card icon on the right-hand side of the screen. Note that you must be logged in to access the convention card application and we recommend setting your zoom level to 100%. To create a card, you can either start with a blank card, by clicking on the New Card button, OR, you can use one of the many predefined templates to create a new card that’s mostly filled in and modify from there. Next, click on the button Copy to my cards next to the template you want to start with. You should now see a copy of the card in your Saved Cards area. 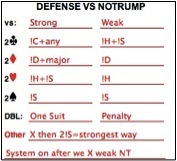 The copy will have all the basic conventions, leads and signaling filled out. Once the copy has been created, click on Edit to tailor the card to your needs. Be sure to change the name of the card and the name within the card itself to reflect the partnership it’s for, and click on Save and overwrite to save your changes. To create a blank card from scratch, click on the New Card button within the application. You can now edit and fill it out at your leisure. Be sure and fill in the Card name at the top, as well as the Names in the convention card body. When you’re happy with your card or get tired of working on it, click on Save and overwrite to save progress on your card. You can always add to it or modify it later! Your new card will appear in the Saved Cards section of the Convention Card application, along with other cards you have created. You can print any card from within the Saved Cards tab by clicking on the View/Print button next to the card you want to print. This will bring up a copy of the convention card for printing in a new tab or window of your web browser. It will include blank space as needed to print properly in portrait orientation on letter-sized paper. Use the browser’s Print function to print the card to your printer. The card can then be folded or cut to size for insertion in a convention card holder. By default, the printer will align the convention card to the bottom of the page. If that doesn't work well for you, you can go into your Account Settings, and change the settings so that the convention card will be top aligned. 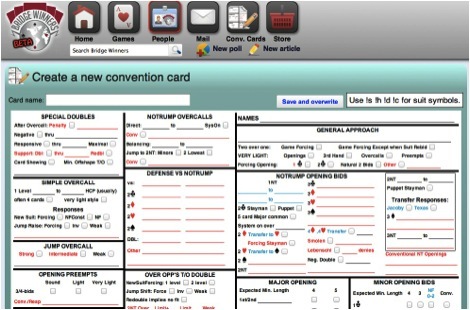 The best way to share the card is with the Share function of the Convention Card application. This will allow you to collaborate on the card with your partner, so that either of you can modify or print it at any time. You can also share cards so that those you’re sharing with can view and print the card, but cannot make any changes to it. You can go completely open kimono and make the card available to the public, so that anyone can view or print it. It’s completely up to you! To collaborate on a card with a specific person, click on the Share button next to the convention card you want to share. A window will pop up prompting you to enter the one or more people with whom to collaborate, and one or more people with whom to share for viewing/printing. You can choose as few or as many people to collaborate with or to see your card as you like. The only caveat is that they must have a BridgeWinners account. Once you’ve entered the people you want to share with, click on Share. The card will now show up in their Saved Cards section as well. Copy the URL (using Ctl-C in Windows, or Command-C on the Mac) from the browser, and paste it into an e-mail to your friend (using Ctl-V in Windows, or Command-V on the Mac). But the best way to collaborate on a card is through BridgeWinners.com, so get your friend to open a free account! 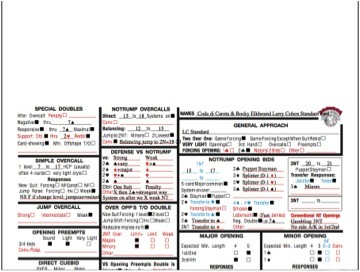 The Convention Card application also supports some simple formatting.